The Neo-Eurasianist perspective on Ukraine was formed already in the 1990s, when Russian fascist Alexander Dugin argued, in his Foundations of Geopolitics, that Ukraine was “an unnatural state” consisting of four major regions with allegedly different geopolitical loyalties, and that a sovereign and united Ukraine constituted a major threat to the geopolitical security of Russia and the envisioned Eurasian Empire. It cannot be excluded that a battle for Crimea and Eastern Ukraine awaits us. Only a short time ago, the most hot-headed among the Russian hawks presumed only an internal conflict in Ukraine, as well as political, economic and energy pressure [on Ukraine] from the Russian side, but now a possibility of a direct military clash no longer appears unrealistic. Although Dugin conceptualised the need of dismantling Ukraine as a sovereign state through non-military measures (or a combination of non-military and military resources, which can be defined as hybrid warfare) in 2009, his Neo-Eurasianist movement became involved in the non-military measures aimed at undermining Ukraine’s sovereignty and territorial integrity already in 2005. The timing was determined by the “Orange revolution” in Ukraine – a series of mass protests against the fraudulent “victory” of Ukraine’s corrupt, pro-Russian Prime Minister Viktor Yanukovych in the 2004 presidential election. The success of the “Orange revolution”, which had led to the second run-off of the presidential election in which Yanukovych’s contender, pro-Western Viktor Yushchenko, won, seemed to have scared Russia’s President Vladimir Putin and the Russian ruling elites. They feared that a similar protest could take place in Russia and put an end to Putin’s regime. The significant contribution of young, active Ukrainians to the success of the “Orange revolution” prompted the Russian establishment to launch a preemptive defence force by reviving, mobilising and consolidating a pro-regime youth movement. In order to counter the largely imaginary threat of a “colour revolution” in Russia, the authorities sanctioned the creation of several “patriotic” youth movements: “Nashi” (Ours), “Rossiya molodaya” (Young Russia), “Molodaya gvardiya” (Young Guard), and some others. One of those movements was Evraziyskiy soyuz molodezhi (Eurasian Youth Union, ESM) – under the leadership of Pavel Zarifullin and Valeriy Korovin – a National Bolshevik youth wing of Dugin’s Mezhdunarodnoe evraziyskoe dvizhenie (International Eurasianist Movement, MED). It is unclear who funded the ESM from 2005, but an analysis of the Russia-based Centre of Economic and Political Reforms shows that the ESM received several presidential grants amounting to more than 18.5 million Russian rubles in 2013-2014. The ESM was active not only in Russia, but also in other countries, including Ukraine. During 2005-2007, branches of the ESM were established in the Ukrainian cities of Kyiv, Kharkiv, Sumy, Sevastopol and some others. These branches cooperated with the Ukrainian cells of the Natsional-Bol’shevistskaya Partiya (National-Bolshevik Party), as well as with Ukrainian far right parties such as the Rus’ky blok (Russian bloc), the misleadingly named Prohresyvna sotsialistychna partiya Ukrainy (Progressive Socialist Party of Ukraine, PSPU) led by Natalya Vitrenko, and “Bratstvo” (Brotherhood) headed by Dmytro Korchyns’ky. Both Vitrenko and Korchyns’ky were members of the Highest Council of Dugin’s MED. The Ukrainian branches of the ESM remained on the margins of the Ukrainian political life, while most of its activities were limited to anti-NATO protests and other similar anti-Western actions, and did not produce any significant result in terms of undermining the Ukrainian state. Moreover, some of the Ukrainian members of the ESM did not share the radical anti-Ukrainian ideas of Neo-Eurasianism. For example, after two Russian members of the movement and one Ukrainian activist of the ESM vandalised Ukrainian state symbols on the Hoverla mountain in 2007, this led to the split in the Ukrainian ESM, as many did not support this act of vandalism. This also led to the termination of any cooperation between the ESM and “Bratstvo”, and Korchyns’ky left the Highest Council of the MED. The radicals, however, welcomed the act and were outspoken in their resentment of Ukraine’s sovereignty and territorial integrity. One ESM activist from the Crimean town of Bakhchisaray, Kostyantyn Knyrik, made no secret of the anti-Ukrainian agenda of Neo-Eurasianism: “Our foremost priority is to focus on the creation of the empire; the first goal is to break Crimea away from Ukraine. To join it to the empire first”. Because of the anti-Ukrainian thrust of Neo-Eurasianism and the Hoverla mountain incident, the leader of the ESM, Pavel Zarifullin, and Dugin himself were banned from entering Ukraine in 2006 and 2007 correspondingly. The Neo-Eurasianist movement largely disappeared from Ukraine by 2008, due to the 2007 split and the measures against the ESM on the part of the Sluzhba bezpeky Ukrainy (Security Service of Ukraine, SBU). Some activists left the movement for ideological reasons, some moved to Russia to continue their anti-Ukrainian work outside the country itself, some joined other pro-Russian organisations, and some abandoned political involvement whatsoever. The minority stayed in the movement, but was hardly visible until the beginning of the Russian-Ukrainian war in 2014. However, Russian Neo-Eurasianists were more successful in cooperating directly with a number of pro-Russian organisations in Ukraine. One of these organisations was the above-mentioned PSPU led by Vitrenko who, at that time, could be described as “the premier representative of radical anti-Westernism in Ukraine”. Vitrenko often took part in various conferences featuring either Dugin or other members of his Neo-Eurasianist movement. Dugin called her “a charismatic politician […] advocating Eurasianist Slavic views” and “a leader of the pan-Ukrainian resistance [to the US]”. Vitrenko’s political narrative consisted of three main points. First, she promoted the idea of creating a political union of Ukraine, Russia and Belarus. Second, she rejected any form of Ukraine’s rapprochement with the EU and the US – the West in general. Third, she labelled all advocates of Ukraine’s independence as Ukrainian ultranationalists or even Nazis. She freely substituted “NATO” with “Nazism” (and vice versa) in her political speeches, attempting to create a strong association between Nazism and the West in general, and – appealing to the Soviet mythology of the “Great Patriotic War” – portrayed a struggle between the “fascist” West and “anti-fascist” Russia. Yet another pro-Russian organisation that Dugin’s Neo-Eurasianists cooperated with in Ukraine was the “Donetskaya Respublika” (Donetsk Republic, DR). This organisation was created in summer 2005 by Andriy Purgin, Oleksandr Tsurkan and Oleh Frolov, as a response to the “Orange revolution” and presidency of Viktor Yushchenko who advocated pro-Western foreign policy of Ukraine. The DR was officially registered in December that year, but already in autumn leaders of the organisation took part in the protest demonstration in Kyiv together with the activists of the ESM. For the DR, the cooperation with the ESM was apparently the most important organisational link with Russia. 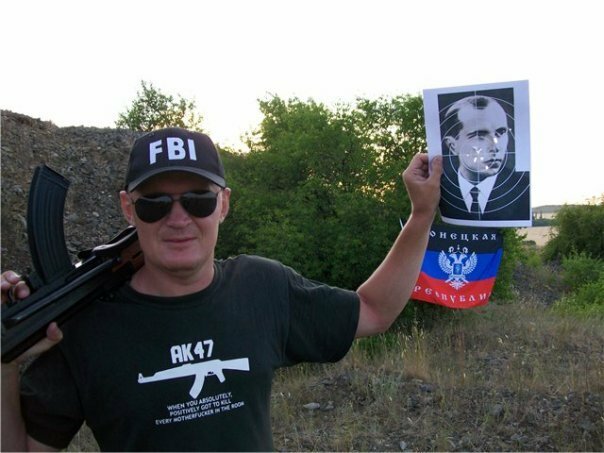 In August 2006, the DR’s leaders, namely Purgin and Frolov, as well as Knyrik and several other Ukrainian ESM activists, went to a summer camp in Russia organised by the ESM. 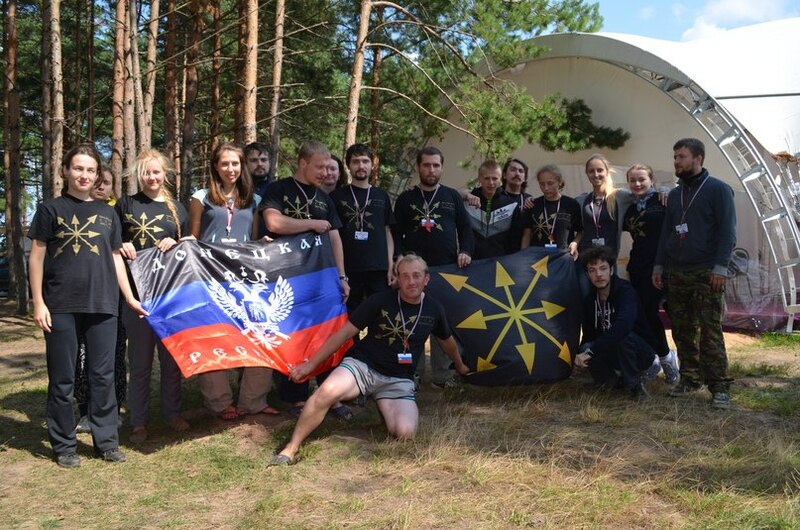 Vitrenko and Oleksandr Svistunov, the leader of the Rus’ky blok, also took part in the camp where they delivered lectures to the participants. Apart from lectures, seminars and social activities, the participants of the camp were engaged in training in violent street protests. One of the trainers was Oleh Bakhtiyarov who had been Dugin’s associate since the 1990s and lived in Kyiv where he was close to the local branch of the ESM. In November 2006, DR and ESM activists collected signatures to hold a referendum on the independence of the “Donetsk republic”. The referendum never took place, but the SBU and police took notice of the group, and cases were brought against the leaders of the DR under three articles of the Ukrainian Criminal Code: (1) “Actions aimed at the forcible change or overthrow of the constitutional order or the seizure of state power”, (2) “Infringement on the territorial integrity and inviolability of Ukraine”, and (3) “Violation of citizens’ equality based on their race, nationality or attitude to religion”. The criminal cases hindered the process of building the DR as a functional structure; in 2007, a Ukrainian court outlawed the DR, and it went underground. Collecting signatures to hold a referendum on the independence of the “Donetsk republic”, Donetsk, November 2006. Oleksandr Tsurkan on the left. [The congress] considers the totally forced Ukrainisation of South-East [of Ukraine] as a form of humanitarian genocide aimed at the destruction of the indigenous Russian population (russkie), replacement of Russian concepts by the “Ukrainian” ones. Considers as a humanitarian crime against the Super-Ethnos of the Russians (Russy) the artificially created community “Ukrainian nation” that does not exist as such and divides the single people into “Ukrainians” and “Russians” (rossiyane). The primordial people of the Rus is the Russian (russkiy) people as an indivisible foundation of the Great Russian Race. The resolution also demanded from the Ukrainian parliament to adopt a “law on the federal structure of Ukraine” through the change of the Constitution of Ukraine. 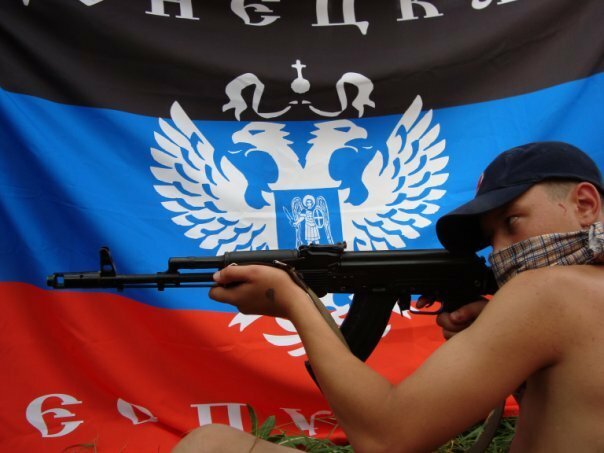 In 2009, the DR declared the “state sovereignty of the Donetsk Federal Republic” that would unite the territories of six Ukrainian south-eastern oblasts: Donets’ka, Dnipropetrovs’ka, Zaporiz’ka, Luhans’ka, Kharkivs’ka, and Khersons’ka. The same year, they organised a camp where members of the DR trained in using firearms and making Molotov cocktails. The DR largely curtailed their activities in 2010. One possible explanation is that deaths of three activists of the DR including Tsurkan – the DR believed that the SBU poisoned them with mercury vapour – might have delivered a blow to the organisation. A more feasible explanation, however, is that the DR’s activities aimed at destabilising the Ukrainian state were no longer necessary after pro-Russian politician Viktor Yanukovych was elected President of Ukraine in February 2010, and another pro-Russian politician, Mykola Azarov, became Prime Minister. The DR, which sometimes cooperated with Yanukovych’s Partiya rehioniv (Party of Regions) – Tsurkan worked in Yanukovych’s electoral campaign office in 2004 – apparently felt that it did not need to attack Ukraine’s sovereignty as long as the country was ruled by the pro-Russian forces. The relation between the reduced activities of the DR and the outcome of the 2010 presidential elections may also explain why the DR resumed its activities and extensive cooperation with the ESM in 2012. This was the year of parliamentary elections in Ukraine, and the pro-Russian forces struggled to retain their power in the parliament, and, thus, undermine the national-democratic pro-Western forces. At that time, Yanukovych’s allies adopted “anti-fascist” rhetoric attacking the Ukrainian far right Svoboda (Freedom) party. Since Svoboda also cooperated with the Ukrainian national-democrats, two “anti-fascist” organisations, Russia-based “World without Nazism” and the “International Antifascist Front” founded by Yanukovych’s major ally Vadym Kolesnychenko, mobilised against the entire national-democratic opposition to Yanukovych trying to discredit it as “fascist”. The DR, with its insistence on the dangers of Ukrainian pro-Western “fascism”, fit well into the campaign against the opposition to Yanukovych. There was another important factor that contributed to the reinvigorated activities of the DR in 2012. It was also the time of heated debates on the direction of Ukraine’s foreign policy. Russia developed its Eurasian Customs Union (ECU) and wanted Ukraine to be part of it. The second option for Ukraine was the Association Agreement with the EU. Even the oligarchic community close to Yanukovych seemed to be divided on the foreign policy issue: some supported the idea of Ukraine joining the ECU; others clearly favoured the rapprochement with the EU and the West in general. It seems viable to suggest both Moscow and Ukrainian oligarchs promoting the integration into the ECU contributed to the mobilisation of the radically anti-Western DR in 2012 as leverage on Yanukovych. Hence, the idea of the integration into the ECU dominated the contacts between the DR and ESM, as well as between other Ukrainian pro-Russian and Russian organisations, in 2012. 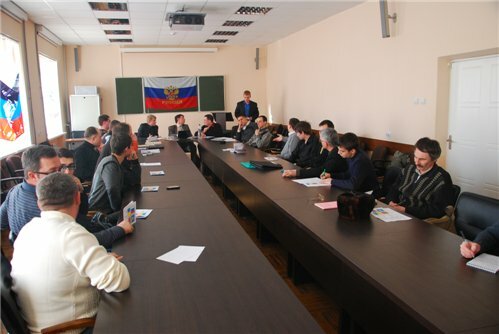 On 18 February 2012, activists of the DR and ESM took part in a small roundtable “The Future of Donbass” in Luhansk. Around 20 Russian and pro-Russian participants adopted a resolution that, in particular, argued that “the ultimate aim of the relations between [Russia and Ukraine] had to be a transition from the regional integration to the building of a new form of the interstate integration” – the Eurasian Union as the next step in the development of the ECU. On 11 March 2012, representatives of various Russian and Ukrainian organisations held a roundtable “Ukraine and Donbass for the Eurasian Union” in the Russian city of Rostov-on-Don to discuss the creation of the Eurasian Union. This conference featured DR’s Purgin, the leader of Moscow’s ESM Andrey Kovalenko, and Serhiy Baryshnikov, associate professor at the Donetsk National University who was known for promoting Dugin’s books and Neo-Eurasianist ideas at his lectures. Kovalenko, in particular, stated the Russian authorities were going to mobilise movements of Russian compatriots abroad, so the pressure groups of this kind could become “a basis for the broad integration movement”. The conference itself concluded with an initiative to create an international NGO “Ukraine for the Eurasian Union”, as well as establishing a special NGO for Donbass named “Donbass for the Eurasian Union” led by Baryshnikov. On 24 May 2012, the ESM announced on its website that the DR opened the embassy of the Donetsk Republic in the Russian Federation: the “administration of the Embassy was temporarily housed in the headquarters of the Moscow branch of the ESM”. The announcement also argued, intrinsically rejecting the territorial integrity of Ukraine, that the opening of the embassy would “contribute to strengthening of the relations between the residents of the Donetsk Republic and the rest of Russia, and to the matter of reunification of the lands of historical Russia artificially disunited in 1991”. Furthermore, the DR was going to issue passports of the Donetsk Republic, and the residents of the above-mentioned six south-eastern oblasts of Ukraine had priority in applying for these passports. Conferences focused on Eurasian integration of Ukraine continued. On 28 July 2012, Donetsk hosted a roundtable “Regional reintegration as a steppingstone of the Eurasian unification” that featured Russian and Ukrainian pro-Russian activists, including ESM’s Kovalenko and other members of the Neo-Eurasianist movement, DR’s Purgin, and Baryshnikov. The participants of the conference declare its principal aim – the creation of the Eurasian Union […]. Donbass can and must become a steppingstone and a support region for the launch of the genuine Eurasian project. Being a geopolitical and historical product and heritage of the Russian line of development, our land represents an optimal trans-regional model of the future integration. Our region is an organic part of the Russian world (Russkiy mir), an epicentre of Novorossiya – the last bulwark and guarantee of the unity of Ukraine and Russia. The current conditions actualise the issue of turning Donbass from the purely socio-economic reality into the political factor. The DR’s activities went beyond conferences and roundtables. On 4 April 2013, the DR organised an attack on a cultural centre in Donetsk that hosted a workshop on Internet technologies. John F. Tefft, contemporary US Ambassador to Ukraine, opened the workshop, but he left before the attack. Several reports stressed the inactivity of the police during the incident; furthermore, the police later stated that there had been no violations of the public order. This reinforced suspicions that the DR had high-ranking patrons in the region who condoned their anti-Ukrainian and separatist activities during Yanukovych’s rule. The same year, activists of the DR and ESM took part in the Seliger educational forum organised by the Russian “Nashi” movement. However, the DR became less active afterwards and mobilised again only after the Ukrainian revolution, Yanukovych’s flight to Russia, and the beginning of the Russian-Ukrainian war that started with the Russian occupation of Crimea at the end of February 2014. Purgin became the “first Vice Prime Minister” of the “Donetsk People’s Republic” (DNR), while Oleh Frolov, became a member of the DNR’s “parliament”. Kostyantyn Knyrik, the leader of the Crimean branch of the ESM, became the head of the Information Centre “South-Eastern Front”. Sergey Baryshnikov was appointed, by the “DNR‘s authorities”, the rector of the Donetsk National University.